After two record operating losses in 2010 and 2011, Royal Air Maroc, the government-owned national carrier of Morocco, restructured and posted record operating profits in 2012 and 2013. While the restructuring was difficult, RAM has emerged in a more fit shape. This is more than seeing the silver lining; RAM may be very glad it went through this process. 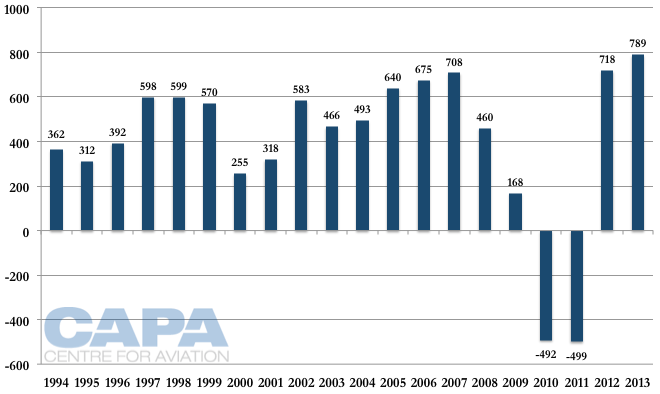 The ratio of staff per aircraft declined from 110:1 to a far leaner 58:1. Passengers carried per employee have increased from 1,054:1 to 2,329:1. RAM is focusing on international traffic at its Casablanca hub, supplementing it with European services to other Moroccan cities where RAM can compete with LCCs. The domestic market is challenging, and the government has agreed to cover the losses. 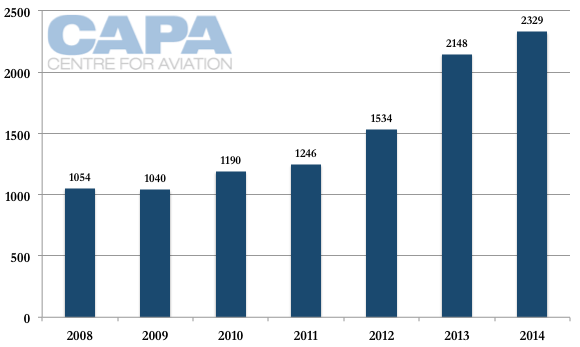 Removal of 10 medium-haul aircraft has seen RAM's passenger figures decrease from 6.1 million in 2011 to 5.6 million in 2013. But RAM is now in growth mode, having received in Jan-2015 its first 787 that will complement its recently refurbished 767 fleet. RAM will also take four more E190s and charter aircraft over the peak summer period. RAM took delivery of its first 787-8 on 02-Jan-2015. RAM ordered four 787-8s in Nov-2005 and these four remain the only RAM 787 aircraft disclosed on Boeing's books. A RAM delivery statement and a separate one from GE, the engine supplier, says RAM will take five 787s. The next four are due to be delivered 02-Mar-2015, 03-Mar-2015, 04-Apr-2016 and 05-Apr-2017, according to Morocco World News. RAM took delivery of four E190 regional jets over Nov/Dec-2014. RAM's business plan calls for the charter of 11 aircraft over peak summer periods. RAM is also studying plans to replace its single 747-400. RAM will tender Airbus and Boeing, including for the A380. The replacement jet would also be used on government and Hajj trips. RAM is mostly a short/medium-haul carrier as approximately 85% of its flights are under four hours. The 787s will complement, not replace, RAM's 767s. RAM had four 767s and these are its core long-haul aircraft. RAM's long-haul points include Montreal, New York JFK and Sao Paulo. The 787 will be used to Montreal and New York (the 747 is also used to Montreal) while Sao Paulo will remain with the 767. There will be frequency increases on existing routes and the launch of new routes, such as to Beijing and Dubai. RAM has made changes to its product, including flat bed business class seats on its 767 and 747. Interiors on RAM's 737s were harmonised with the widebody fleet. This project involved 29 aircraft (25 737s, one 747 and three 767s). On some aircraft RAM removed seats to create more space in hopes of pushing its premium positioning. A new IFE system was installed on its 767 which gives every passenger a screen in the seatback. This is a notable investment and logical as RAM intends to keep the 767s in the fleet in the medium term at least. Other aircraft in the fleet have a streaming wifi entertainment solution. RAM's Casablanca and transit lounge were renovated, as was RAM's Paris Orly lounge. These improvements are part of RAM's aim to achieve a four star rating from Skytrax and would also help it as it weighs joining a global alliance. RAM has been able to focus on its long-term future since completing its restructure. RAM's crisis was sparked by two large losses: an operating loss of MAD492 million (USD53 million) in 2010 and MAD499 million (USD54 million) in 2011. Since 1994 RAM had previously posted operational profits. RAM returned to operational profitability in 2012 with a record MAD718 million (USD77 million) profit, followed by an operating profit of MAD789 million (USD85 million) in 2013. Margin and revenue figures were not disclosed and 2014 figures are not yet available. RAM received a government injection of MAD1.6 billion (USD186 million) over 2011 and 2012. The government also agreed to cover RAM's loss-making domestic services the airline was not eager to keep. Prior to the influx of European capacity from an open skies deals, RAM's finances were more consistent. "We can't afford unprofitable routes," RAM VP Saida Najioullah told the Dubai Aviation Festival conference. In Sep-2014 it was reported the Moroccan government was preparing a study on domestic air services. The study will reportedly provide short, medium and long term strategies for the promotion of domestic air transport and will consider the role of Royal Air Maroc, financing, state incentives and regulatory and procedural frameworks. The potential impact to RAM is unclear. Importantly, the government also allowed RAM to re-structure, including downsizing staff, a move other governments might not have the stomach for. The Moroccan government not only put the nation ahead of the national carrier in allowing greater competition, but the government had the good sense to allow RAM to restructure the airline. Failing to support cost reduction in these circumstances is a fatal, or near-fatal, move many other governments have made. This re-structure not only brought RAM back to profitability but also made it more efficient than it was before open skies with the EU. Without open skies, RAM would have been unlikely to see such a negative environment that forced its over-restructuring. "It was a good thing even if done in a hurtful way," Ms Najioullah said of open skies, without which RAM would not have "achieved the result" of record performance. RAM's performance going forward has uncertainty over fuel hedges, a common thread for many airlines. RAM told the Gulf News in Nov-2014 that it hedged half of its 2015 fuel bill as part of a five-year plan that expects Brent fuel to be USD110 per barrel – figures that are double Jan-2015 rates. RAM did not hedge in 2014. RAM's restructuring involved removing from service 10 medium-haul aircraft and downsizing its staff by 1,560. The exact meaning of this 1,560 figure is unclear as RAM also says it had 5,352 employees in 2010 but only 2,737 in Apr-2014, figures that are consistent with its stated employee:aircraft ratio. RAM downsized staff faster than aircraft withdrawals, leading to a gain in labour productivity. RAM benchmarks its performance to be ahead of full service competitors and near that of LCCs, although RAM notes LCCs do not have their own sales network, which RAM does. 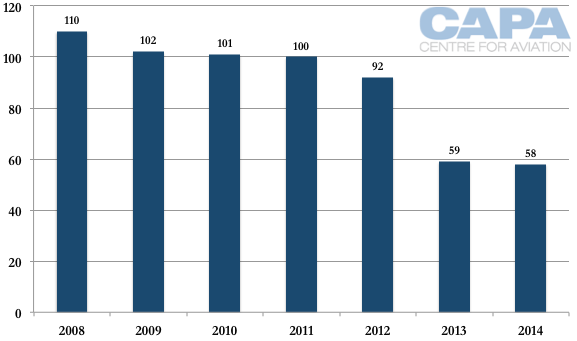 RAM is also carrying significantly more passengers per employee after its restructuring. The decrease in fleet size was partially offset by improved fleet productivity, although specific figures are unavailable. 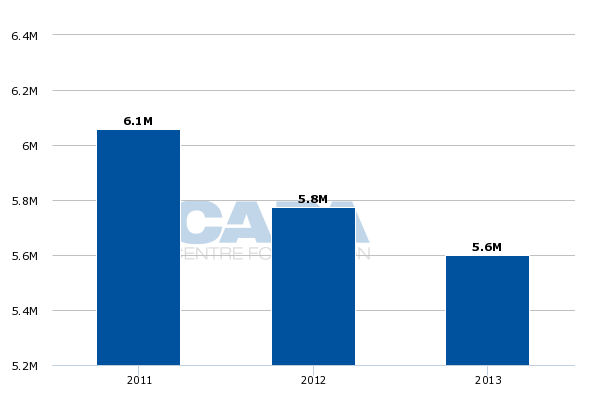 RAM carried 5.6 million passengers in 2013, a 3.0% from 2012's 5.8 million, which in turn was a 4.7% decrease from 2011's 6.1 million. Passenger revenue in 2013 fell at an equal 3% rate to MAD13.38 billion (USD1.44 billion). Passenger revenue accounted for 93% of RAM's business. 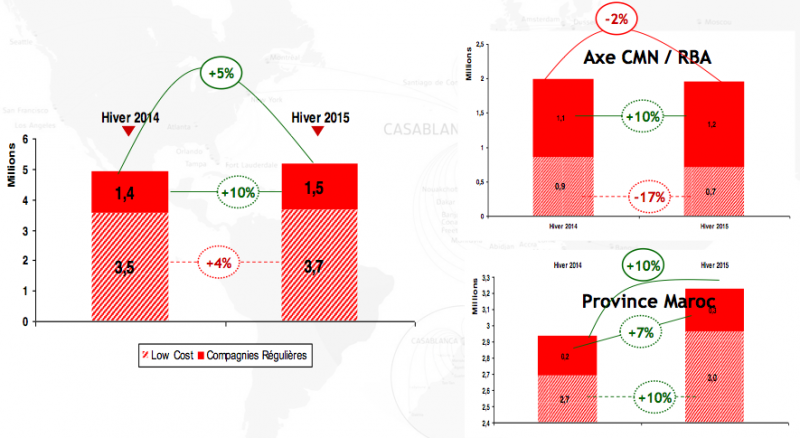 RAM attributes the overall drop in passenger figures to a 13% decrease in point-to-point flying, which it defines as international traffic outside its Casablanca hub. RAM wants to focus on its Casablanca hub and is not so interested on routes from other Moroccan cities, which have a greater leisure orientation and are more suitable to LCCs. "We don't want to be all over Morocco on domestic, tourist routes," Ms Najioullah said. RAM's Casablanca hub carried 1% more passengers in 2013 mainly on the strength of North America. Complete figures for 2014 are not yet available, but RAM says traffic within Africa increased 16% to 1.3 million in the year to Oct-2014 while domestic traffic increase 20% to 790,000 in the same period. RAM attributed domestic growth to government-led initiatives to promote air connectivity. Growth in North America in 2015, as well as the launch of new routes elsewhere in the world, will see RAM's traffic further climb. Two thirds of tourists to Morocco go to Agadir and Marrakesh. About 20% of RAM's seat capacity is in the domestic market, and flights from Casablanca to Agadir (AGA) and Marrakesh (RAK) are RAM's two largest domestic routes by far. These routes are for local traffic but also tourist connections. The strong tourism focus in Agadir and Marrakesh – and not Casablanca – helps to insulates RAM from LCC competition in its hub. Casablanca is its largest hub by far, and Paris Orly is larger than any of RAM's other domestic cities. 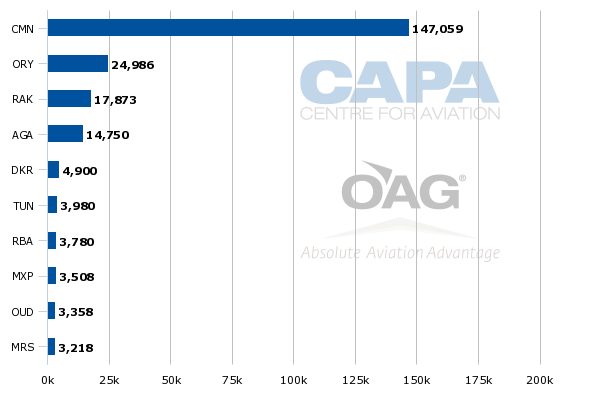 LCCs account for a significantly higher share of capacity in Agadir and Marrakesh than in Casablanca. RAM expects Casablanca and the capital of Rabat to further shift to full service airlines while LCCs make gains outside. In 2014/2015 winter ("hiver" on graph below), RAM expects overall capacity to Morocco to be up 5% from winter 2014/2013. This will comprise 4% growth from LCCs and 10% (but from a smaller base) from full service airlines. 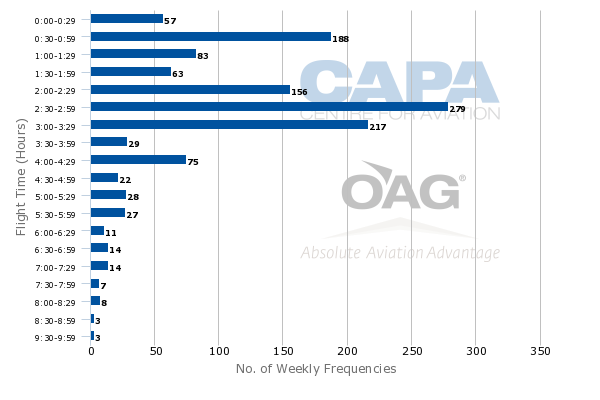 Within Casablanca and the capital Rabat ("Axe CMN/RBA" on the graph below), RAM expects overall capacity to decrease 2% as LCCs shrink by 17% and full service airlines grow by 10%. However, outside of Casablanca and Rabat (Province Maroc on graph below), RAM expects capacity to increase 10% as full service airlines grow by 7% and LCCs 10%. Some attempts to re-enter leisure routes have not worked. RAM withdrew from plans to serve Marrakech-Geneva after easyJet proved too aggressive on price. Marrakech-Milan was resumed in Mar-2014 but service ended in Jan-2015 with no indications it would return. During the restructure, RAM disposed of non-core assets and also overhauled its sales networking, including closing nine RAM-staffed agencies as the airline pushed online sales. 25% of RAM's sales came from online sources, comprising 13% of overall sales from its website and 12% by online travel agencies. RAM re-launched its website and saw a 22% improvement in online sales in Apr-2014, one figure disclosed. Visitor numbers were up by 19% at the end of May-2014. Part Two of this report will look at RAM's growth, including increased frequencies to New York JFK and Sao Paulo as well as launching new destinations including Beijing and Dubai. 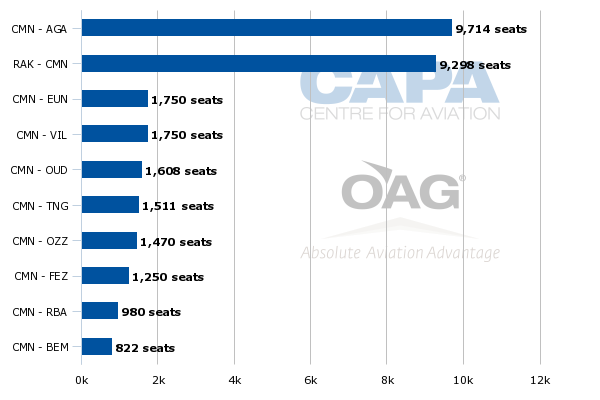 The growth is being made possible as RAM receives 787s, but these bring a large increase in premium seats. RAM is weighing up whether to join a global alliance in a bid to boost its corporate travellers and connections to other parts of the world. Besides its home market of Morocco, RAM would bring an alliance access to Central/West Africa, RAM's largest international market after Europe. RAM is planning more growth within Africa.